Jeff Mang, Plant Manger, tells attendees how VR business services have helped HBD Thermoid meet their workforce development needs. 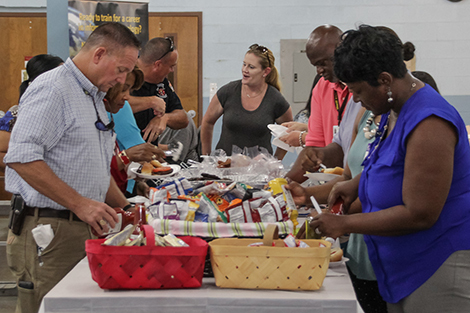 “We’ve hired ten percent of our workers through the VR SWAT program,” Jeff Mang, plant manager of HBD Thermoid, tells a group of business and community leaders during the 1st Annual Camden Area Business Cookout at the Camden Work Training Center on August 17. The group includes more than 40 representatives from Lee, Kershaw and Camden counties, who are learning firsthand how VR helps businesses find talented employees through services such as Skilled Workforce Apprenticeship Training (SWAT). A VR client may participate in a SWAT for up to 12 weeks, explains Robert Truesdale, VR Business Development Specialist. During this time, the client learns the job with assistance from VR staff. It is also an opportunity for the business to evaluate a potential employee’s abilities, and a chance for the client to determine if the position is a good match. “VR has done a tremendous job getting [their clients] ready to join or rejoin the workforce,” says an enthusiastic Mang. The SWAT program also helps employers offset the cost of training for higher skilled jobs. In the case of HBD Thermoid, those savings “go right on the bottom line and actually allowed us to increase the pay rate for our folks,” says Marie Vanhoy, Human Resource Specialist. Mang appreciates this attention to detail, and the thoroughness of the VR staff. The 1st Annual Camden Area Business Cookout. Jeff Mang (right) Plant Manager of HBD Thermoid with Skip Cranfill, Operations and Materials Manager and Marie Vanhoy, Human Resource Specialist. Attendees network at the 1st Annual Camden Area Business Cookout. Summer Rigby, Camden Area Supervisor, welcomes attendees to the 1st Annual Camden Area Business Cookout. Robert Truesdale, Business Development Specialist (left), introduces attendees to four job-ready VR clients who assisted during the event. Business and community leaders from Lee, Kershaw and Camden counties enjoy hamburgers and hot dogs at the 1st Annual Camden Area Business Cookout.